Lori, a mom of six, shared this sentiment about her youngest at Mile High United Way’s Supplies for Success event. She explained that it’s an important morale boost for all her children, especially her youngest. Lori said that it’s nice for Zakirah to feel like she has something in common with her older brothers. Someone else who had a lot to say about the successful event was Yakira. “I’m excited to talk to my new teacher and make new friends,” the soon-to-be first grader said. The most amazing thing about Supplies for Success is the wide range of children being served. 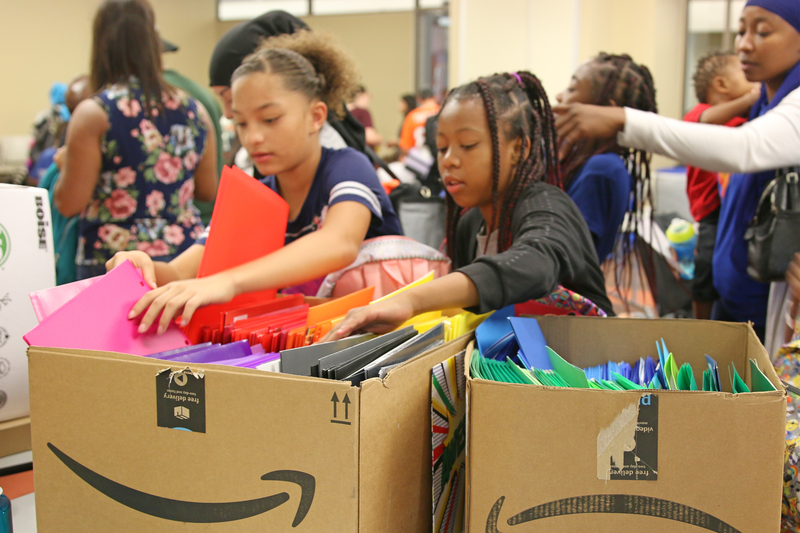 Thanks to Mile High United Way’s corporate partners and partner agencies who ran school supply drives, Mile High United Way was able to serve 173 children at Supplies for Success this year. Each year, a group of Metro Denver’s young professional leaders host and volunteer at the event, as part of Mile High United Way’s Catalyst Society (formerly part of the Mile High United Way Emerging Leaders Council). These volunteers spent over 125 hours organizing and handing out $18,000 worth of school supplies collected for the event this year. One sister made sure that wouldn’t be the case for her younger sibling. Karina heard about the event through social media and brought her sister, Yeseina. “I needed a binder for 8th grade and I got this great red binder. This was really helpful,” Yeseina said. It’s the small things that make a difference. A binder, a backpack, some pens, and pencils. Zakirah is going to feel great walking into school with her brand new backpack. Yakirah might meet some of her best friends by sharing some pencils with them. Yeseina could use that new binder for math and realize that she’s found a new favorite subject. The possibilities for these children go far beyond the supplies. Back-to-school supplies can cost anywhere upwards of $100. Most families in Metro Denver can’t afford that cost, let alone for more than one child. That is where Mile High United Way comes in. Supplies for Success gives local families an opportunity to provide for their children. By uniting partner agencies, corporate partners, and individuals in our community, Mile High United Way is able to make sure that every child in Denver has a strong start and is ready for school. Learn more about how Mile High United Way is Giving Children a Strong Start. Mile High United Way fights for the education, health, and financial stability of everyone in Metro Denver. Together, we ensure young children enter school ready to succeed, children are reading at or above grade-level by third grade, youth are graduating from high school ready for the workforce or post-secondary education, and individuals and families have their basic needs met and the opportunity to move toward economic success. BBH, Coors Distributing, Deloitte, Eide Bailly, Exclusive Resorts, Grant Thornton, Holmes Murphy, JE Dunn, Mile High United Way, PayChex, PwC, Rigden Farms Senior Living, Shared Service Solutions, TD Ameritrade, Trinet, ULA, and Vectra Bank.